Difficulty: Fairly strenuous with some steep climbs and descents of up to 300 metres in total. Very little shade. 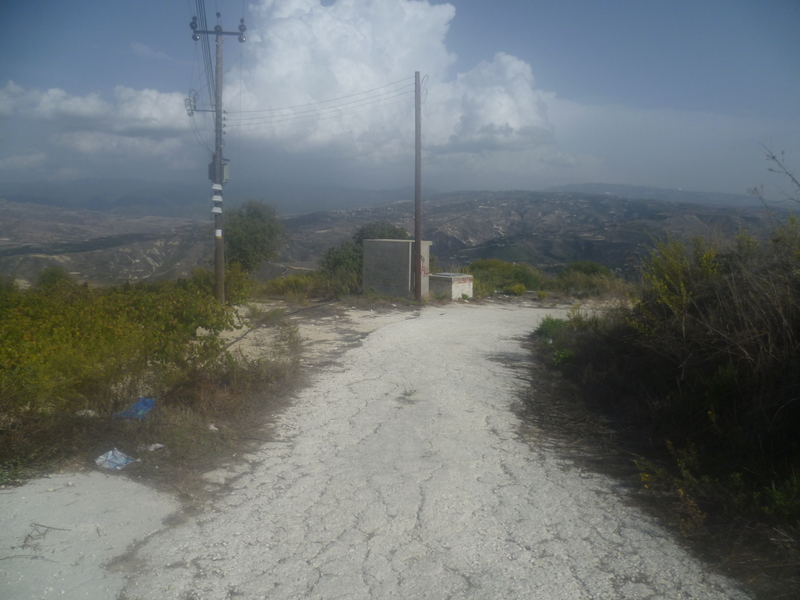 This is a fairly arduous walk among the hills north-east of Paphos but one which is well worth doing. The hiking takes you off – and above! – the beaten track, offering splendid views over the surrounding countryside. You will walk through fertile foothills, alongside deep ravines and have the chance to explore a deserted Turkish village. In October 2015 the area bore extensive scars from a recent forest fire. However, the green shoots of recovery are in evidence and hopefully this resilient landscape will soon return to its former glory. Some of the sections are quite remote so do make sure you are adequately equipped with sufficient water, maps and compasses. 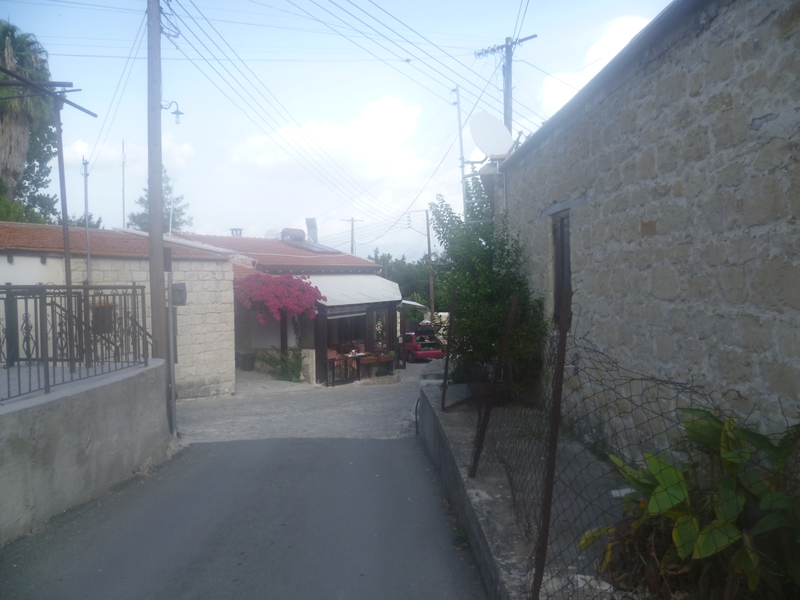 The walk starts from the small village of Miliou, situated just off the B7 Paphos-Polis road, about 9 miles south of Polis. Take the signed B7 turn-off and drive past the Agii Anargyri Spa Hotel, crossing over a bridge with iron railings and parking in a lay-by on the right- hand side of the road. This is just short of the village itself, which is higher up the hill ahead, but you will return from your walk this way. Start the walk by returning along the quiet asphalt road back the way you have just driven. 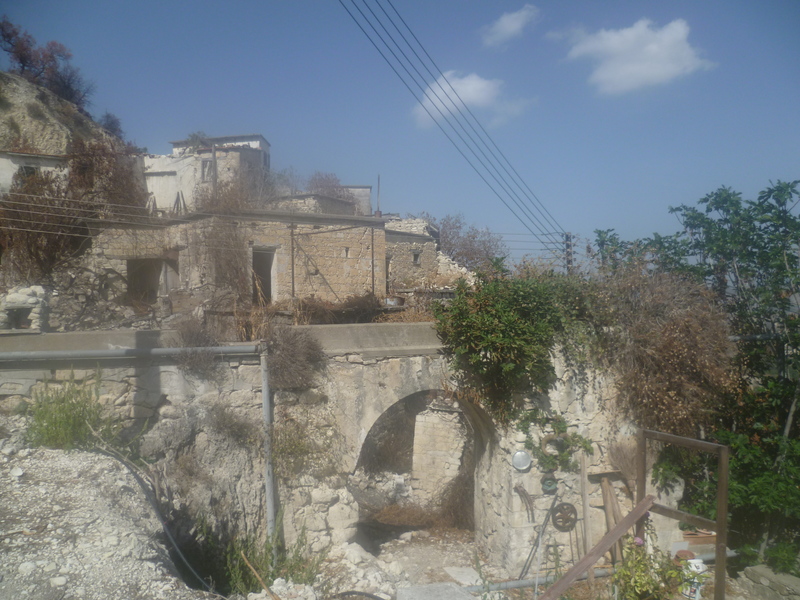 You will cross the bridge and head up a hill past the Agii Anargyri Hotel on your right. This was once the site of a 17th-century monastery, thought to be one of the first on the island, and the nearby sulphur springs today make this location a popular spa resort. A short distance beyond the hotel the road bends around to the left and your route lies straight ahead on a concrete track (7 minutes). Follow this track uphill and to the right until you reach a junction with a steep concrete track heading down towards the right (11 minutes). If you look high up ahead in the distance you can see the destination village of Kato Theletra and, beneath it, a panorama of the various tracks which you will be following to get up to that ridge. Don’t be put off…it’ll be worth it for the views alone! Turn right and take the concrete road downhill, descending into the Neradhes Valley and swiftly reaching the valley bed. This is fertile land and, at the time of walking, the friendly (if somewhat bemused) local farmer was out picking melons and oranges. Cross the stream-bed and turn right, heading up the other side of the valley and around the contour. After a section of steep climbing you will arrive at an uphill right-hand bend with a smaller track sprouting off left (20 minutes). Take the left track as indicated in the picture below. Follow this uphill as it veers slightly to the right and arrives at a small junction with a track to the right. Continue straight ahead, walking now with views across almond trees and more distant fruit groves to the hills on your left. After about 250 metres you will arrive at a fork in the track: the path that you are on curves away to the left and a track to the right rises uphill. (31 minutes) At the time of writing there was a Hunting Conservation Area sign at the foot of this track. Take the right-hand track, walking uphill and ignoring a clear track off to the left after about 40 metres. Instead, take the right-hand path and continue climbing. At a Y-fork after a further 200 metres (on crossing a small gully), stay left. 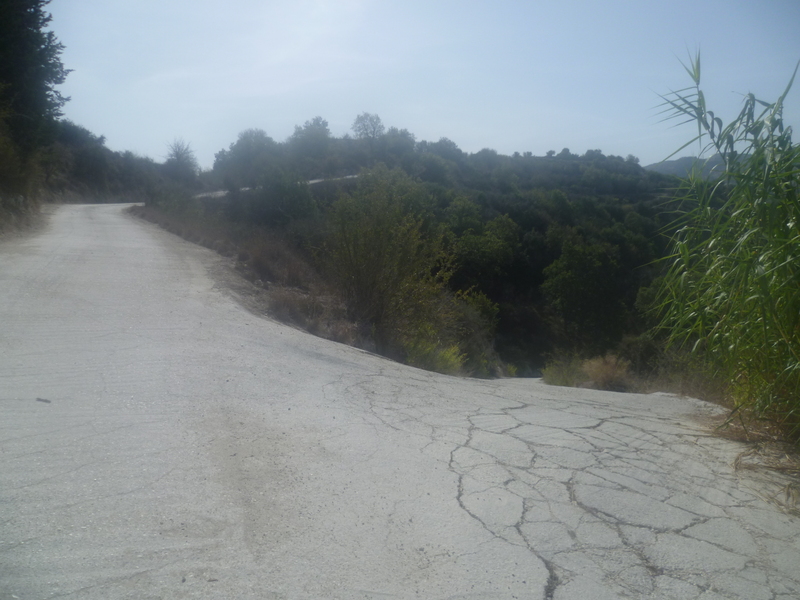 The path now starts to gradually descend into the Neradhes Gorge and, by staying left on the main path at all further junctions, you will continue downhill towards vineyards and almond groves. 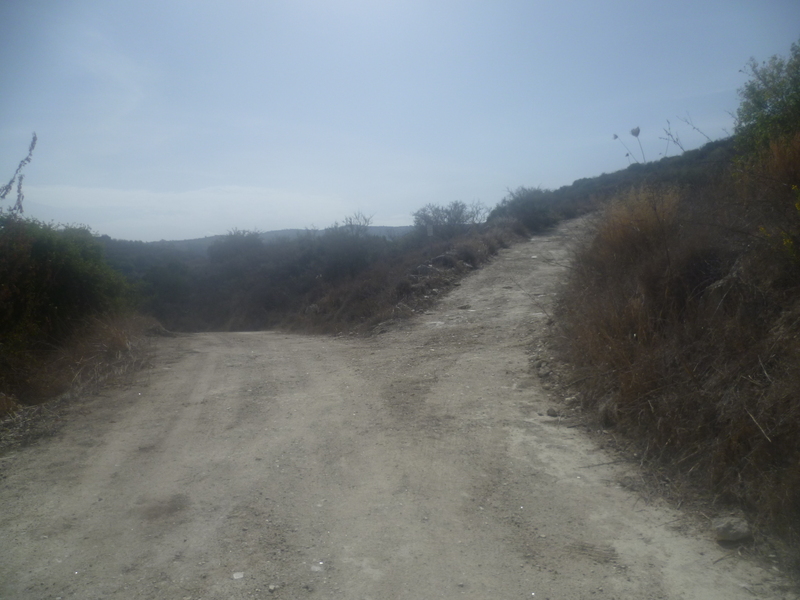 A large detached house across the valley on your left confirms that you are on the right path. You should reach the Neradhes stream-bed, evident from its giant reeds, after about 50 minutes. Although the area was quite dry in October, it’s clear that fording the valley floor may well be a different matter in spring. And although there were few birds to be seen in October, this would be a birding spot worth revisiting in the spring. Cross the stream-bed and continue to walk along the track which follows the course of the stream below and to your right. Ignore a right-hand fork leading down to the valley bed and continue to walk above the stream, your path gently undulating, until you re-cross the stream at around 1 hour. The track, now concreted in places, climbs steeply uphill with the gorge to your right. After climbing for around 6 minutes you will reach a hairpin bend where you turn sharply left and continue uphill, as indicated in the picture below. 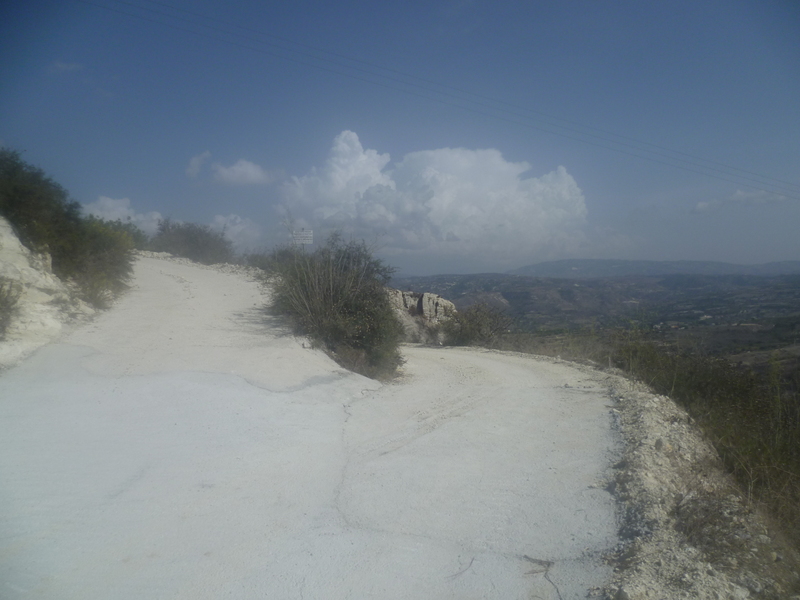 Continue to climb up this track until, at 1 hour 19 minutes, the gradient starts to level out and you arrive at the largely deserted village of Kato Theletra, allegedly abandoned as a result of landslip fears. Your route will head away from the village uphill along the asphalt road to your right, but take a little time to explore this fascinating spot. When you’re ready to leave, return to the start of the village and walk uphill along the asphalt road until it bends sharp left at 1 hour 25 minutes. 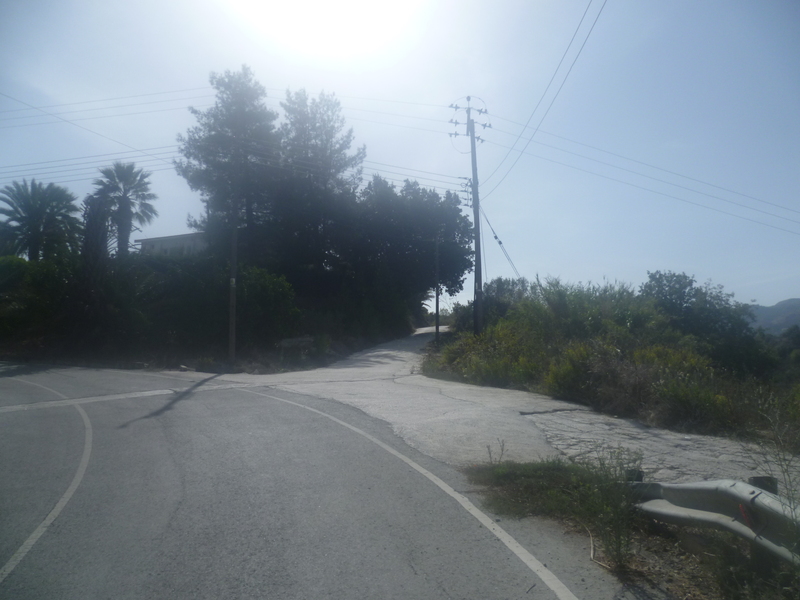 Here, take the concrete road which goes straight ahead and runs downhill alongside telegraph pole number L3-36-21-8. Stay on the main track passing a rocky outcrop on your right. Your track contours the slopes and you can see the village of Yioulou to your right, with Mount Olympos in the background. After 1 hour 50 minutes you will arrive at a small clearing where a small track which forks backwards on the right is followed by an upward track to the left. Take the left track uphill, as indicated below. Ignore any minor tracks and follow the main track to another fork after 100m. 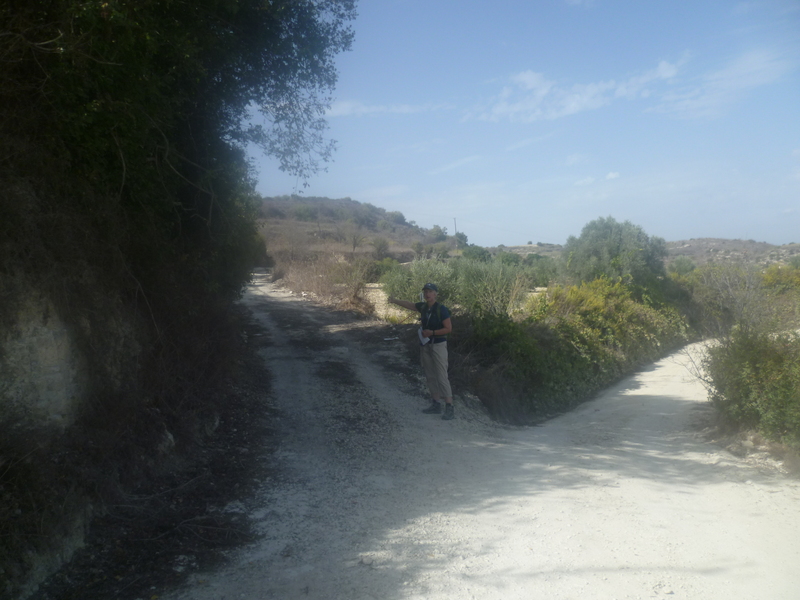 Turn right here and follow the contour path between vineyards and olive groves. You will pass a concrete block hut on your left with a bench, in direct sunlight when we passed, unfortunately! 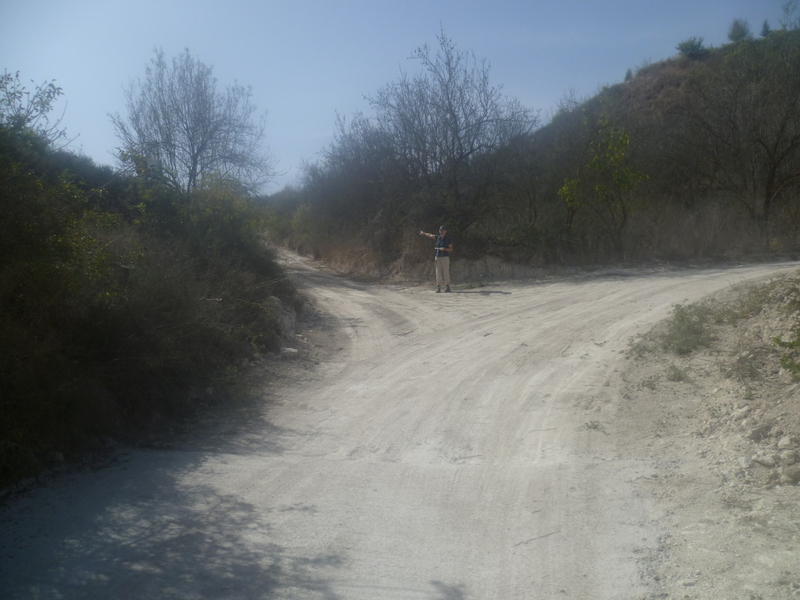 Shortly after, you arrive at a junction where you will turn right and continue steeply downhill on a stony track. There is a little scrambling involved and you will need to watch your step. 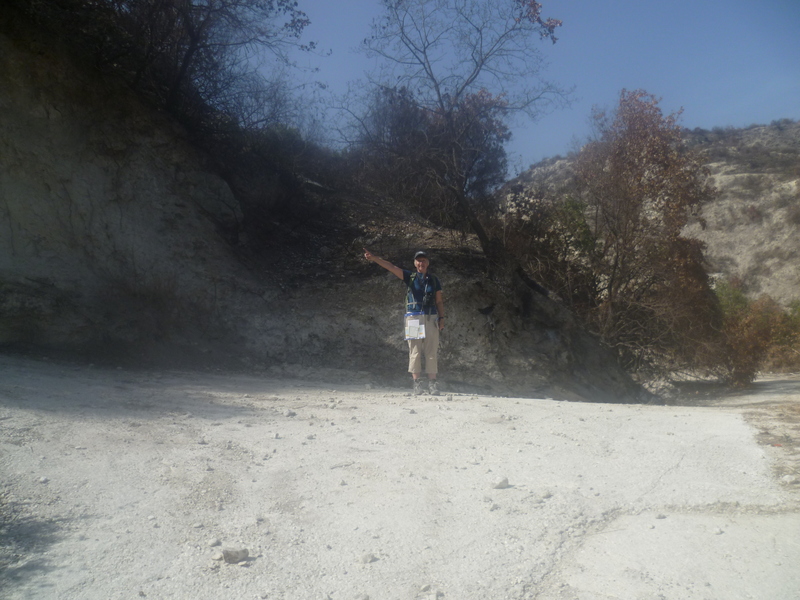 At about 2 hours 5 minutes you reach the valley floor and begin climbing a rough dirt track up the other side. This is a fairly continuous steep gradient for about 15 minutes and on a hot day represents a good fitness test. By the time you reach a junction at the top (2 hours 20 minutes) you will be glad to know that there is no more uphill walking left today! At the junction itself, ignore the track off to your left and, with the telegraph pole on your left, take the concrete road straight ahead which leads you downhill. This is effectively your path for the rest of the walk back to Miliou. The road winds around to the right here and you should keep following it as it descends gradually round the gorge, ignoring tracks off to the left and right. 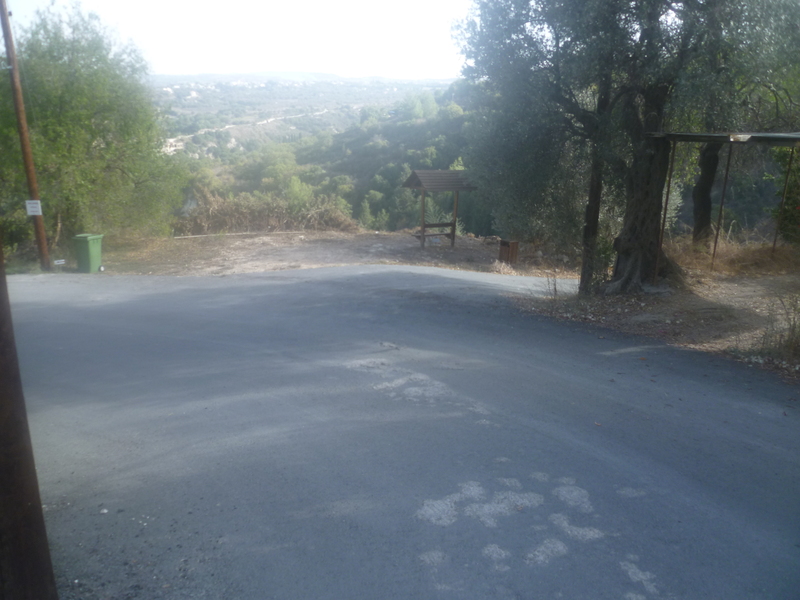 A group of concrete water tanks on your left (2 hours 41 minutes) will confirm your path, and about 10 minutes later you will arrive at the asphalt road coming from Kathikas on the left. Turn right down here and follow the road round to the left into the village centre. Here, there are a couple of cafés where you can enjoy a cold drink and a delicious ice cream, or, if you are feeling peckish by now, a meal. When you’re ready to move on, continue downhill through the village and follow the road as it wends its way back to the lay-by where you parked your car, arriving at 3 hours 5 minutes. Bird List – October 2015: Chukar, Collared Dove, Common Buzzard, Cyprus Warbler, Goldfinch, Grey Wagtail, Hooded Crow, House Sparrow, Jackdaw, Kestrel, Magpie, Robin, Spanish Sparrow, Stonechat, Wood Pigeon.